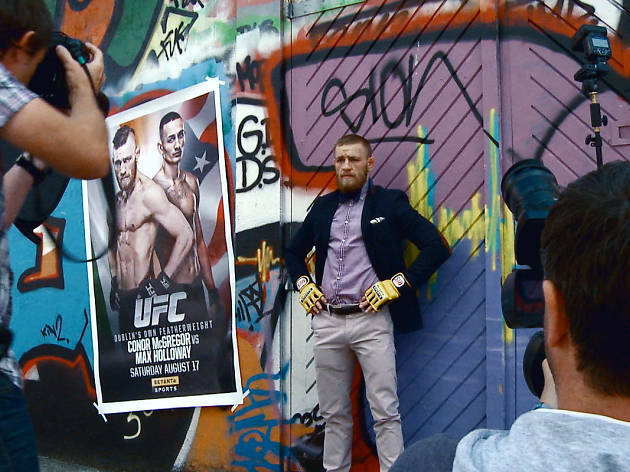 A fawningly punch-free look at the rise and life of UFC champion Conor McGregor. 'I was a little chimp with a chip on my shoulder. Then I became a gorilla…’ Shot over four years, this excess-all-areas bio-doc chronicles the evolution of mixed martial artist Conor McGregor, a silverback blessed with whack-a-mole-hammer fists, a talent for trash talk and ferocious, swaggering charisma. He’s introduced to us living in his mum’s spare room, claiming benefits and dreaming of his Ultimate Fighting Championship debut. By the end of Gavin Fitzgerald’s film, the Irishman has powered through a rags-to-riches arc, flooring champions with a single punch and attracting the adoration of Arnold Schwarzenegger. Sports docs like this are all about luck, and Fitzgerald gets plenty of it, despite the film wrapping before that infamous Floyd Mayweather brawl. McGregor’s trajectory is like four Rocky movies crushed into one – the underdog rise, staggering victory, chastening defeat, then a dogfight revenge match that goes right to the final round. You couldn’t make it up. Still, there’s a question here: how close do you get to your subject before you become a disciple yourself? With no distancing voiceover, the film submits to McGregor’s will completely. Given the fighter’s taste for controversy, you’d expect Fitzgerald to land a few probing counter-shots but he seems more fixated on McGregor’s sudden vast wealth (the mega-mansion, the supercars, the private jets), which is drooled over with a suspiciously covetous gaze. As a bombastic insight into twenty-first-century sport, where even the weigh-in attracts a whooping sell-out crowd, the film has value. However, ultimately, it’s just another cog in the McGregor hype machine, settling for the chest-beating tone of a pre-fight press conference. Fans will get a brutal blood rush from the thunderous fight footage, but unlike the UFC’s octagonal ring, this brand hagiography is mercilessly one-sided.